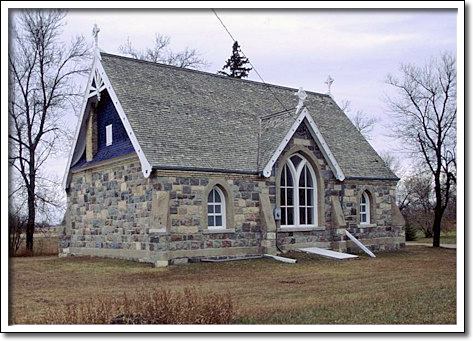 Between 1890 and 1910, more than 200 Methodist and Presbyterian churches were built in Manitoba. While most were small, wood-frame buildings, some larger church communities were able to build more elaborate churches of brick or stone. Occasionally, a small congregation might undertake such an ambitious project. In 1896, local stonemason Henry Winter was commissioned to build the Presbyterian church. His design, with its rugged stonework, pointed Gothic-style windows, and restrained woodwork, recalls the small parish churches of Scotland and England. In Manitoba, Griswold United is one of the fullest expressions of that tradition.